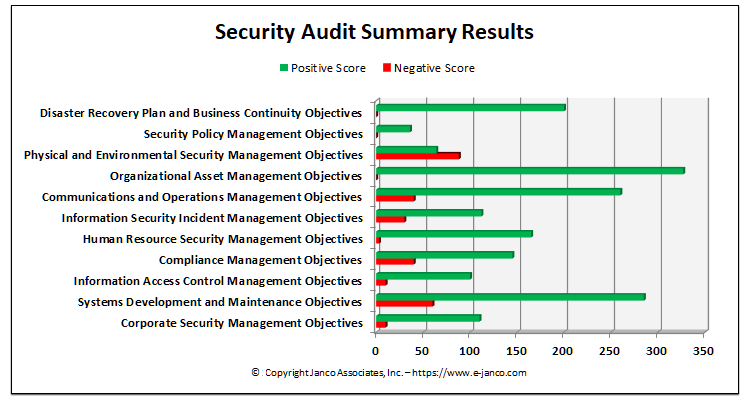 This Security Audit program contains over 400 unique tasks divided into 11 areas of audit focus which are the divided into 38 separate task groupings. The audit program is one that either an external auditor, internal auditor can use to validate the compliance of the Information Technology and the enterprise to the ISO 27000 Series (ISO 27001 and ISO 27002, Sarbanes-Oxley, HIPAA, and PCI-DSS. IT Toolkits update service is available for the Security Audit program. The update service is for 12 months from the date of its purchase. This subscription also provides you with membership in our ELITE SUBSCRIBER SERVICE which provides you with copies of Janco's and IT-Toolkits' White Papers, Surveys, and selected new products before they are released to the general public. Audit Program Summary - Lists the 11 areas of audit focus and the 38 task groupings that are included within the audit. The point summary on this work sheet is calculated automatically by Excel. Audit Program Detail - Lists over 400 detail tasks the need to be completed in the audit and the relative point value of each task. The only thing that the user needs to do is check the yes or no on each item and re-assign a relative point value for each task. Audit Program Graphic - Lists the 11 areas of audit focus and a bar graph which shows the weights that are assigned to each area. The point summary on this work sheet is calculated automatically by Excel and the graph is automatically updated. Sample Audit Program - This is copy of the Audit Program Detail with data entered into the individual tasks. Sample Audit Program Summary - This is a copy of the Audit Program Summary with the links changed to point to the Sample Audit Program. This is a summary graphic that was produced from the Excel worksheet provided as the Audit Program. In the sample above it is easy to see those areas where improvement is need. © Division of Janco Associates, Inc.